Great! You’re adopting an agile methodology for your digital project, but you don’t know what’s the best structure and what are the characteristics of an effective team capable of executing and delivering in time with great quality. Very often we hear someone speaking about the greater advantages of the Agile philosophy when compared to the “traditional” plan and execute in the long term waterfall approach of building digital projects. On the other side it’s indeed true that very few times we hear someone speaking about the team’s characteristics that best fit the agile philosophy when working on a project. Doing consultancy @Altar.io & 10kstartup, many time I’ve been meeting corporate managers trying to figure out the best team structure for their innovative projects. On one hand, at a corporate level, my first suggestion is that, if your core business is not a tech-related one, you shouldn’t hire tech talents on a full time basis. You can either set up an internal team of contractors (if there’s an experienced project manager within your firm) or outsource to an agile consultancy agency with proven track record and experience on a project basis. On the other hand, if you’re starting a new tech-focused startup from scratch, the rational is a bit different; take the time to read the article CTO, Developers, Agency? What’s the Best Way to Build Your Startup? My co-founder Daniel nailed the topic. Choosing the option to work with talented contractors or to outsource to an agile agency might give you the power to achieve your goal earlier, with better quality and with a more efficient cost structure. Multi-skill: Each project requires different skills in order to work and not simply a one or two highly qualified people. A mid complexity project requires people focused on architecture, frontend, backend, design and product. No hires: You won’t be able to hire all of the roles representing all the skills needed in a short period of time. Often, in order to simply do something you might face the tough decision of building something in a tech stack that is optimal because you simply can’t hire right now in the most cutting edge stacks. Cheaper to try: the cost structure might be more efficient. I don’t mean that working with freelancers is cheaper, it is more expensive in terms of daily/hourly rate but over the year it should widely compensate due to not needing a team for most of the time. It’s not a fixed cost: the relationship gets to an easy end (end of contract), and then no money will be spend to train your workforce for executing the specific project. Time-to-market flexibility: you don’t probably want to commit to a team with rigid size, so in this case you can scale the team up and down as each sprint requires faster or slower delivery. Having said that, what you manager needs to do if you go with contractors / agile agencies, is to carefully cherry pick the resources / the right partner, otherwise the afore-mentioned optimisation won’t move too forwards. At an agency level, you must assess its track records and ask for references. Surely you remember their famous motto “All for one and one for all”. Well, this Musketeer attitude highlights the point that the team members together own the responsibility of getting the job carried out. They win and they fail as a team. People who have a deep, mature knowledge of a discipline and broad, but not as deep, skills on other relevant areas. If that was not the case, it would always happen a too huge workload for a single resource, causing blocks along the flux as it was a rigid structure. Let’s imagine, John is a world class expert on Elastic Search, but her’s also capable of building and managing backend Node.JS modules. John works mainly on the database, but, if needed, he’ll be able to drain part of the workload from the backend developer who is in need of a hand. Digital teams are exactly the same as basketball teams. First of all, you agree that a basketball offence action is an agile sprint: you want to score, you want things properly done. Chris Paul, aka Play Maker/Point Guard: the best ball handler and passer among the team members. He drives the offence phases, calls schemes and directs the play. He’s also called “the coach of the floor”. Michael Jordan, aka Shooting Guard: good handler and passer, he’s a good shooters from three-point range. Lebron James, aka Small Forward: the most versatile among the five. He’s a good shooter and has a great power “to get to the line”. Tim Duncan, aka Power Forward: similar to the pivot but with greater shooting capabilities. Shaquille O’neall, aka Pivot: also called the centre, he plays down at the baseline, close to the basket. Great in catching rebounds and contesting shots, he usually is the tallest. Their goal, as a team, is very simple: get the ball through a hoop and prevent the opponent team to do the same. The opponent being inertia, lack of clarity and of collaboration between the team. Well, let’s focus on the offence side. One role deserves a separate focus: the Point Guard. Being the “coach of the floor” and the most expert dribbler and passer, you can see him as the project manager. He films the game, manages the players steering them towards the desired directions: To get the ball in the basket. All the other roles are similar but very different: each of them is a deep expert in one position, but with great skills to play on other roles and helping the team-mates in case of need. The same should happen in an agile team: one capable, analytical Project Manager and other valuable members, the greatests on their job but with broad skills on other roles, always ready to help the other members to put the ball into the hood, to close the sprint. “Basketball skilled” means Lebron who plays roles 1, 4, 5, MJ who plays role 1 and 3. Team members with a musketeer attitude and basketball skills are in a good position to Swarm. Yes, because one person alone cannot win a basketball match. 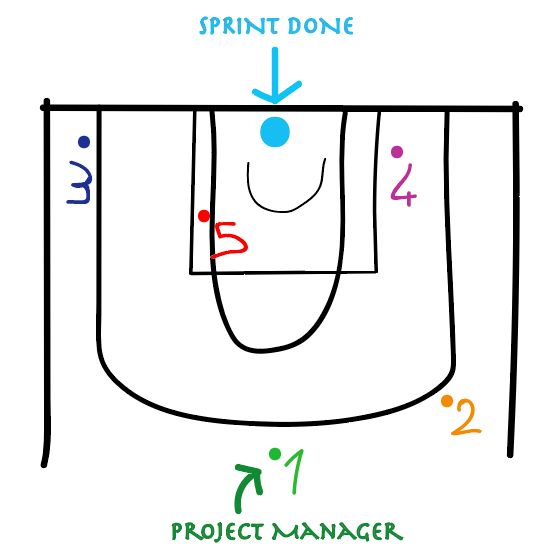 5 people together, in a team that swarms towards each sprint delivery, win the game. A manager should look for a true basketball team, willing to swarm and with a “musketeers philosophy” that has a great understanding of product, crafts beautiful UX/UI and is ahead of the curve in tech terms so your firm can have a technology stack that will be up to date for years to come. Looking and picking partners with the afore-mentioned characteristics is not an easy and fast process. It requires strong experience and flair to identify the perfect resources that suits those key roles. If your core business is not a tech-related one, you shouldn’t hire tech talents on a full time basis!